On the flipside of our dramatization of real CIA operations is the other big movie of 2012 we somehow missed, and that is Argo. 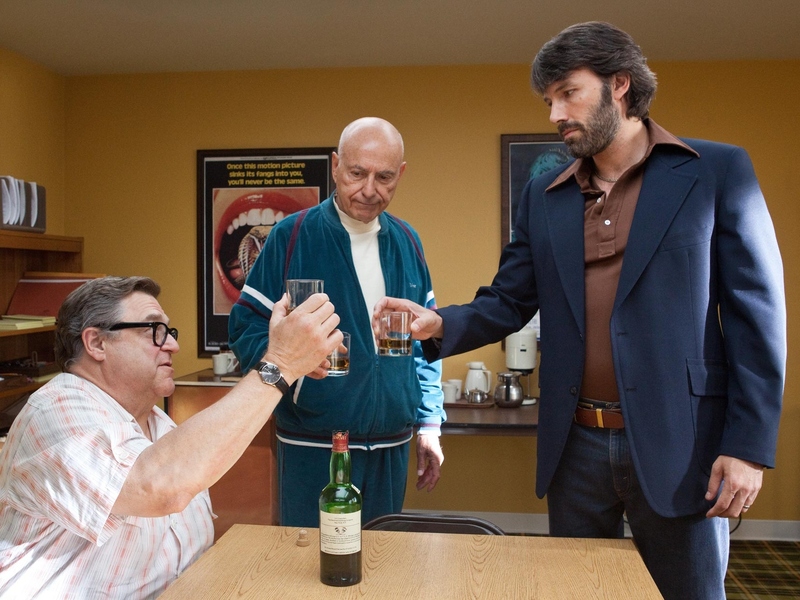 Argo follows CIA exfiltration specialist Tony Mendez (Ben Affleck) as he worked to rescue six escaped Americans from Iran after the American embassy was overrun in one of the most dramatic events in history. Mendez created a cover of a movie in a plan that proved crazy enough to work. Mendez’s mission was a tricky one: getting hostages out while making sure the US was not officially recognized in these rescue efforts. Needless to say, he couldn’t go around firing automatic weapons like James Bond. At the same time, he wasn’t torturing anyone to get information like Maya in Zero Dark Thirty. With that in mind, Argo maintained a middle ground in tone; more serious than Skyfall, but more lighthearted than Zero Dark Thirty. We see images (carefully reconstructed from historical photographs and footage) of violence committed by the Iranian revolutionaries. We also get to laugh with film producer Lester Siegel (Alan Arkin). That said, Argo was a surprisingly nonviolent spy thriller. There was only one death that occurred on screen, as well as one that happened off screen, both committed by Iranian revolutionaries. Despite that, the movie opened with a historical blurb giving the situation in Iran backstory, and thus allowing the viewer to empathize with the Iranians (Whereas Zero Dark Thirty made it clear al-Qaeda were the bad guys). While Argo was based on historical events, I did feel director Ben Affleck did a better job of keeping things exciting than Steven Spielberg did in Lincoln. I went into the movie already knowing this CIA op was one of the most wildly successful rescues in recent history. With that in mind, I’m not entirely sure the subplot involving Mendez’s family was really important. To me, it felt in place more to keep Mendez from slipping into 007 (or Maya) territory and show that he has a life outside of the CIA. As Tony Mendez is a real person, I’m not sure it was necessary. Overall, I would say the movie was as good as Django Unchained as far as 2012’s releases. If I were the Academy, I would have allowed for a two-way tie between them. It is definitely 2012’s best spy thriller, beating both Skyfall and Zero Dark Thirty. As hard as it is to believe, this is the second full 4/4 I am giving a 2012 movie. Not Best Picture-worthy, but still thrilling, tense, and entertaining enough to be the perfect movie the Academy could have chosen. Nice review.